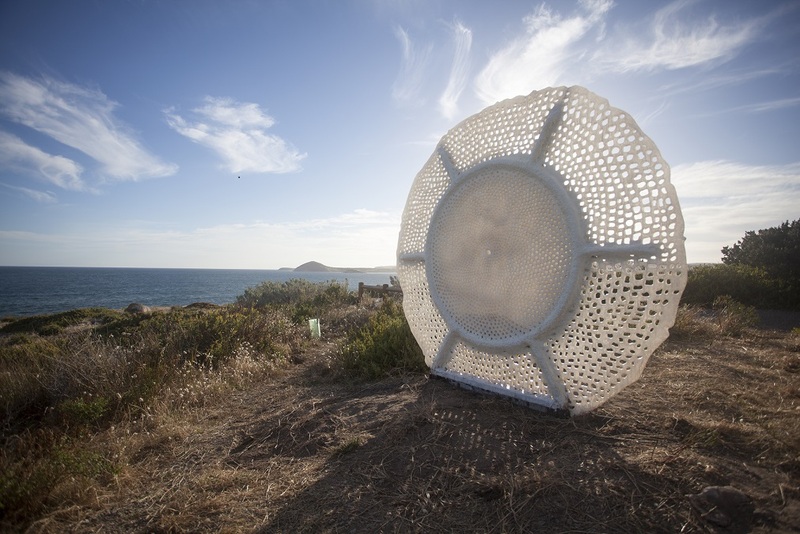 Greg Johns, Sculpture Encounters, Granite Island 2017. Photo Mike Moore. Norton Flavel, Sculpture Encounters, Granite Island 2017. Photo Mike Moore. 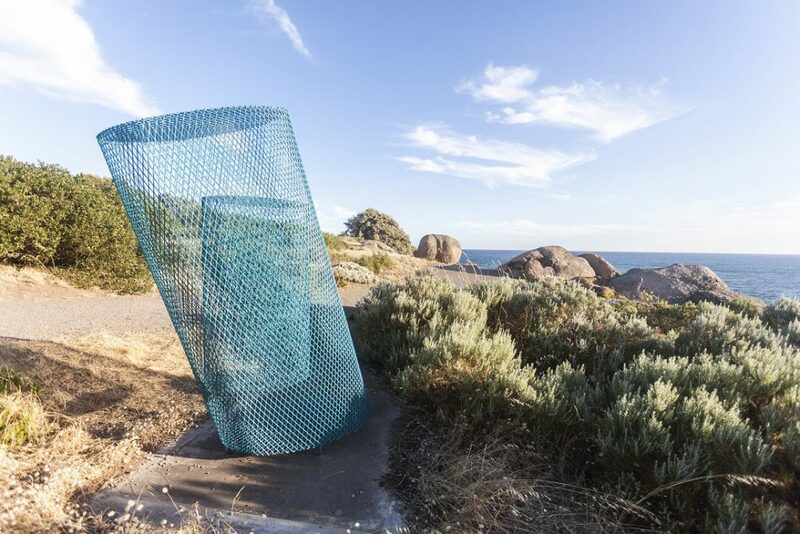 Britt Mikkelsen, Ocean Lace, Sculpture Encounters, Granite Island 2017. Photo Ron Langman. Keizo Ushio, Oushi Zokei 2017, Sculpture Encounters, Granite Island 2017. Photo Mike Moore. Masayuki Sugiyama, Blue Cylinder Revolution, Sculpture Encounters, Granite Island 2017. Photo Mike Moore. 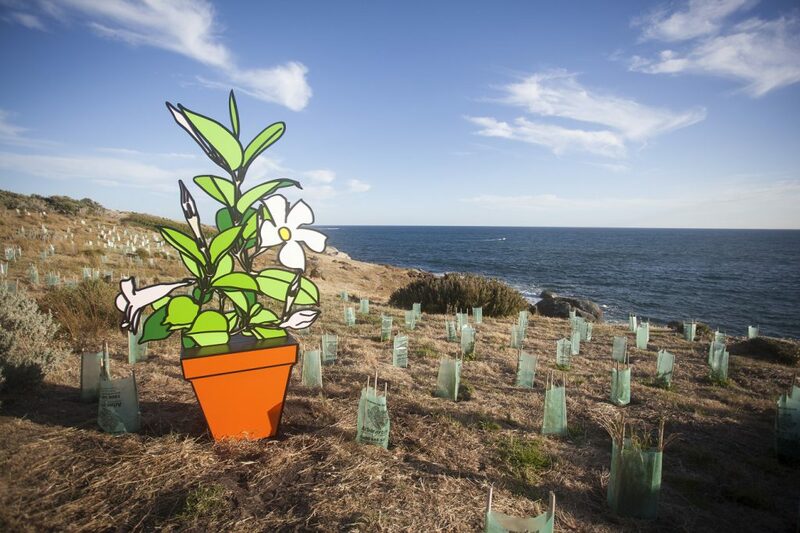 Marcel Cousins, Pot Plant, Sculpture Encounters, Granite Island 2017. Photo Mike Moore. 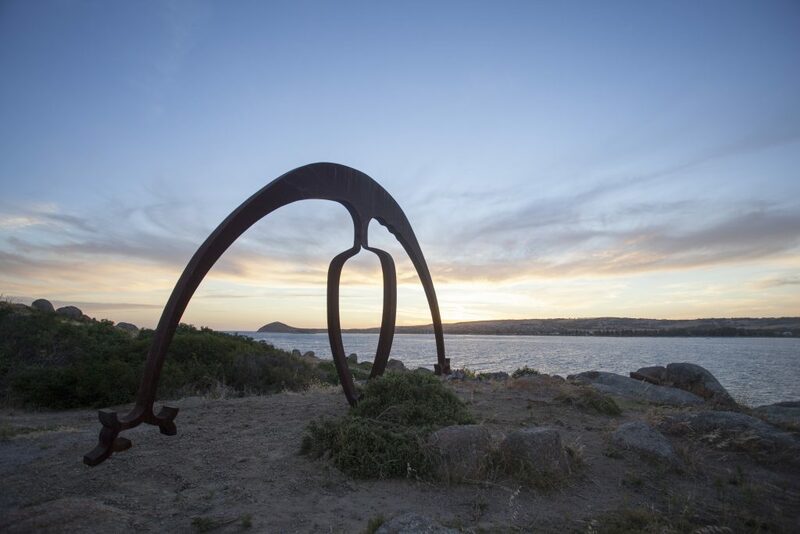 Hamish McMillan, Bystander, Sculpture Encounters, Granite Island 2017. Photo Mike Moore. Margaret Worth, Walking Looking Talking Noppan Nukkan Yunnan, Sculpture Encounters, Granite Island 2017. Photo Mike Moore. 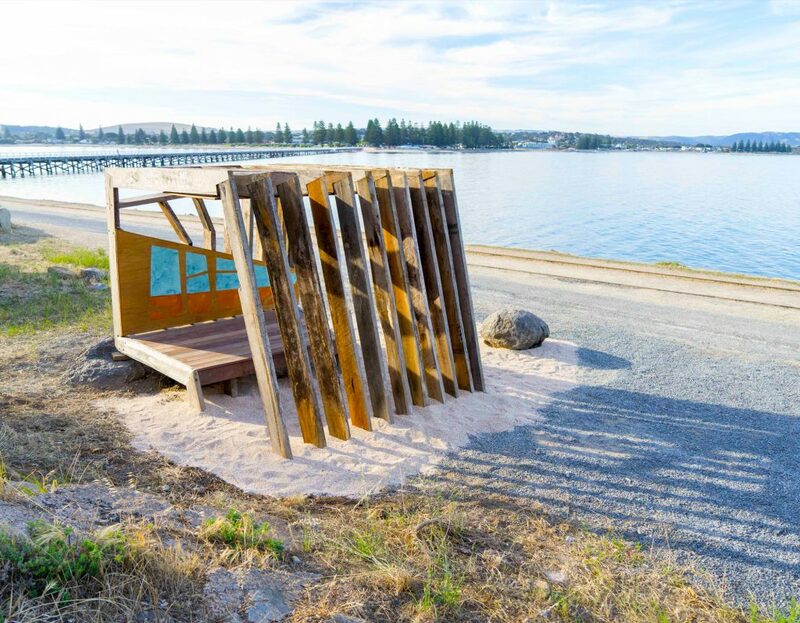 A permanent sculpture trail for the people of Victor Harbor and South Australia and their visitors. 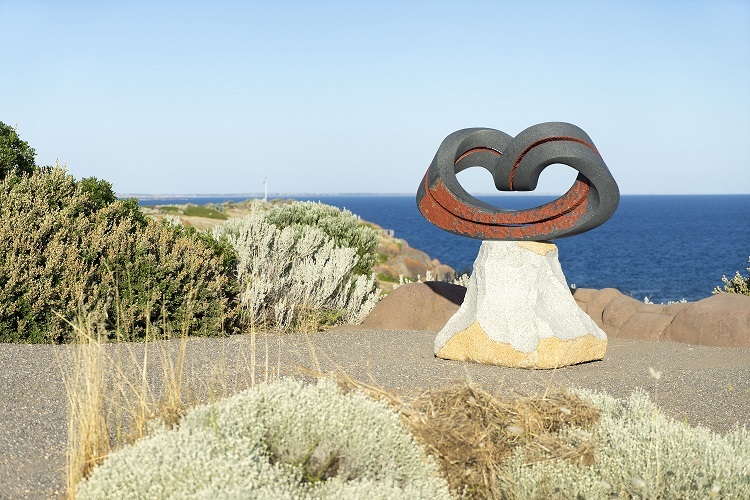 ‘Sculpture Encounters – Granite Island’ places sculptures by artists from South Australia and across the world among the spectacular scenery and coastal views on Granite Island. By integrating sculptures into the landscape it aims to provide visitors to the island with a different experience as they wander the track. The sculptures are leased from artists who have previously exhibited in one of the Sculpture by the Sea exhibitions at Cottesloe Beach in Perth or on the Bondi to Tamarama coastal walk in Sydney, together with specially commissioned installation works for sites on Granite Island. Each of these works has been carefully selected by our Curatorial Panel. The ‘encounter’ harks back to the extraordinary occasion when the vessels of Matthew Flinders and the French explorer Nicolas Baudin happened upon each other in Encounter Bay in 1802. Now visitors to Granite Island will be able to encounter sculptures by artists from across the seas with works by Keizo Ushio and Masayuki Sugiyama from Japan and Peter Lundberg from the USA. 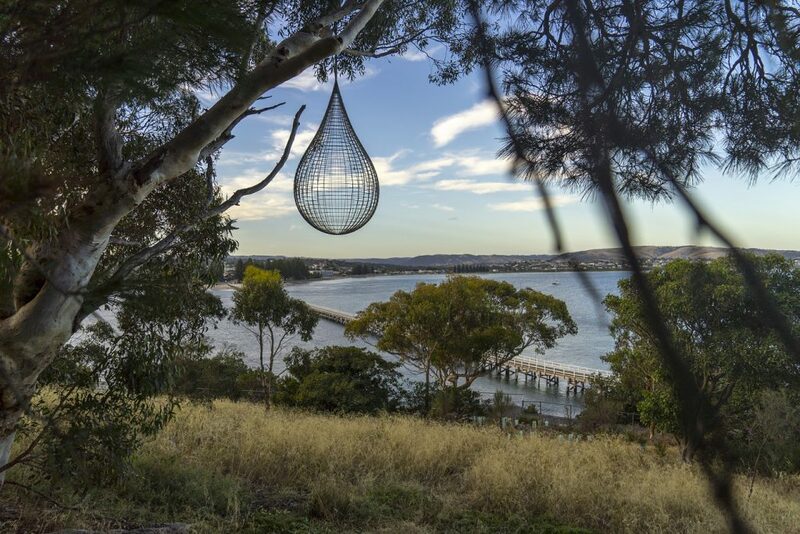 These will be the first of many international artists whose sculptures will be included in the sculpture trail joining artists from near and far including Hamish McMillan and Margaret Worth from the Fleurieu Peninsula and Greg Johns from South Australia. Looking further ahead, every six or so months additional sculptures will be installed, evolving and growing the collection. We hope you will view the sculpture trail as your own.